Play with Underdog for Free?! Many Portland companies participate in health and wellness programs in which they reimburse their employees for health and wellness activities like Underdog leagues. Wondering why your company should fund a company team? We'll give you 8 great reasons! Compensating teams in Underdog leagues is a great way for employees to hang out after work and can result in better "team building" for your office or company. Scroll down for a list company policies we’ve put together. Corporate Wellness programs are a great way to track fitness and compete against co-workers, all while lowering insurance costs. But how impactful are they, really? Here's an idea for a way to add some excitement and generate buzz for your Corporate Wellness program: how about adding Sports Leagues to your plan?! Get the exercise along with the team building, competition, and a great social experience! 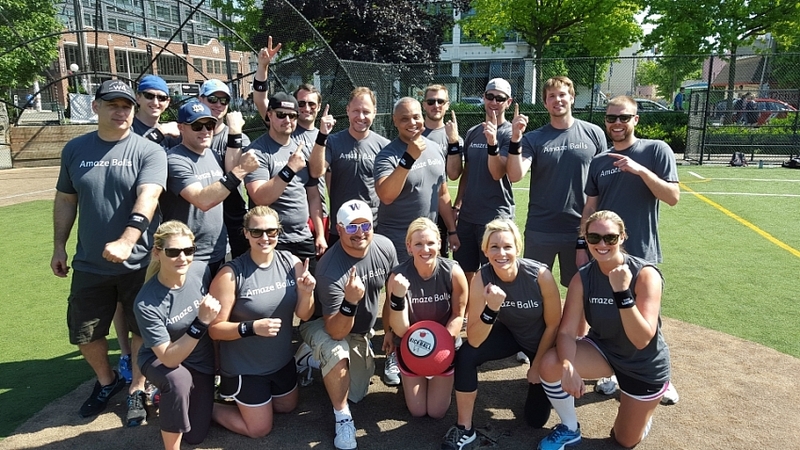 No matter how sophisticated your wellness program is Underdog will make it easy to incorporate a fun Kickball, Football, Volleyball or Softball season for your employees. Let Underdog do the leg work to set up and host a laid-back league. For questions about adding sports leagues to your corporate wellness program, or creating private leagues or events around your companies schedule and location, feel free to drop us a line at events@underdogportland.com. If you see any changes we should make to your company's reimbursement program or if you would like to have your companies policy added, contact the Underdog office at (503)282-1155 or email us at companykickin@underdogportland.com. Adpearance - Fully funds annual company Kickball team. Advantis Credit Union - pays 100% of registration fees for annual company Softball and Kickball teams. AltSource - Fully funds the company Softball team. Bargreen Ellingson Food Service Supply & Design - Reimburses 100% of participation fees. Call Ruby - $100 per employee to spend to create community within the company. Cardno - Reimburses 50% of participation fees. Cascade Energy - Reimburses 50% of participation fees. CLEAResults Consulting - Reimburses 100% of participation fees. Cloudability - Reimburses 100% of participation fees and also funds a safe ride home for employees from company sponsored events. Coast Products - Funds employee Volleyball team, encouraging teamwork and dependence on one another. Cook Security Group - Fully funds Kickball & Flag Football teams. DaBella Exteriors - Fully funds the company Softball team. DKS Associates - Volleyball, Bowling and Kickball Teams. Don Tankersley & Co. - Fully funds a company Dodgeball team. Easy Media - Reimburses 100% of participation fees. EYELEVEL - Funds 100% of Underdog Softball fees for employees. Float On - Reimburses 100% of registration team fees. Friends Of The Children - Volleyball and Softball Teams. Fully - Fully funds a Company Team. Geffen Mesher - Reimburses 100% of participation fees. Harry L. Stearns - Fully funds annual company Kickball team. Holst Architecture - Reimburses 100% of participation fees. Idealist Consulting - Fully funds a Company Kickball Team. KINK - Reimburses 50% of individual and team participation fees. KOIN-6 TV - Pays 100% of participation fees. Milwaukie Lumber Co - Funds company teams as an out-of-work opportunity for employees to have fun and exercise. Otak- Reimburses up to 50% of participation fees. Rogue Brewery - Reimburses 100% of bowling team participation fees. SHOPKEEP - Reimburses 100% of participation fees. Starbucks - Reimburses up to 50% of team participation fees, equipment, or uniforms with a minimum of 3 Partners on the team. Stumptown DJs, LLC - partially funds individual participation fees and subsidizes the cost of team hats and t-shirts. Wildwood Veterinary Clinic - Pays 100% of participation fees. Don't see your company listed, Email us and we'll contact them for you.